Adorning the entrances and courtyards of homes, business, and temples alike is the kolam. In other parts of India, it is known as a rangoli. The word rangoli is derived from the word “Rangaavali,” where “rang” means color in Hindi and “aavail” refers to a row of colors. These beautiful designs are very common in Chennai. 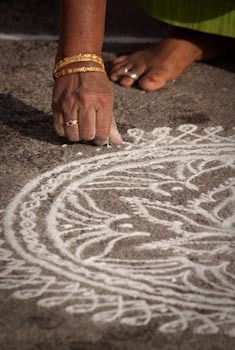 Here, women typically use rice flower to draw their kolams, expertly recalling designs passed down from generations. Besides making a beautiful design, the rice flour feeds ants, insects, and birds. Rice flour is also considered an offering to the Hindu goddess Lakshmi, the goddess of wealth as well as rice. Kolams, originating about 2,500 BC in the Indus Valley Civilization, are believed to invite prosperity and wealth to the home or business. Every morning I see women preparing the entryway for a fresh kolam. First the area is swept using a traditional broom. Next the area is either washed or sprinkled with water. Holding a small plastic bowl of rice flour in the left hand, the woman then bends down and begins the design using her right hand. Everyday kolams are typically white, a symbol of purity. On special or festive occasions, kolams become very colorful. The inclusion of yellow turmeric powder in a kolam denotes prosperity. A kolam is normally drawn with bare fingers using a pre-determined number of dots. The simplest designs may have a square (or diamond) grid of 3x3 dots. More complex ones may have up to 7 dots per side. Some patterns are drawn looping around the dots, leaving the original dots clearly visible. The dots are symbolic of the challenges faced while the curvy lines show how we maneuver over and around these challenges on our journey of life. I am especially impressed with the delicate snowflake-like designs, drawn freehand or with a series of lines. Nowadays, there are also “cheater” methods including perforated rolling tubes, perforated trays, and stencils. One of my apartment neighbors, an artist, uses rice flower paste, her ornate expertly drawn designs standing out on the tiled floor. Rice flower paste is also used for special occasions, such as festivals and weddings.